While Jack Dorsey’s other company Twitter might be struggling, Square continues on a roll that’s keeping Wall Street happy. There’s going to, as always, be a big question mark for Square because of Dorsey’s tenure at Twitter — which is hardly going well. While the company’s latest quarter showed a flash of optimism, the company’s efforts to close a sale with Salesforce and other potential bidders fell through for a number of reasons (trolls included). There are questions of Dorsey’s ability to navigate Twitter’s complex problems, and that could easily extend to Square. Still, things at Square seem to be going well. The company reported another solid performance in the third quarter, beating Wall Street’s expectations. It reported revenue of $439 million and a loss of 9 cents per share, compared to estimates of a loss of 11 cents per share on revenue of $431 million. Shares were up as much as 6% when the report came out, and are up around 4% right now. A lot of the other key metrics for Square continue to rise. 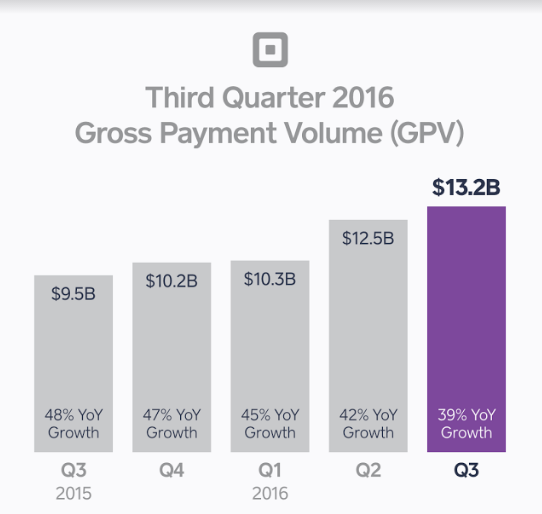 Gross payment volume — a measure of how much money is flowing through the company — was up 39% year-over-year in the third quarter to $13.2 billion. The company also said it processed more than 35,000 business loans for a total of $208 million, which was up around 70% from the third quarter last year. Square also said it had margins of around 7%. Last quarter, Square got a much-needed bump when it reported better-than-expected results. In particular, the amount of funding Square Capital extended more than doubled year-over-year in the second quarter. That’s going to be increasingly important for Square, as it would seem that with the oomph the company is throwing behind it Square Capital could evolve into a tentpole service for the company. That’s not without challenges, however, as in recent months — especially following the Lending Club CEO exiting fiasco — institutional investors have become more wary of alternative investments. If it becomes more difficult to gather capital to extend as loans, that means Square will have to dip into its own pool and take a big risk on its potential clients. That kind of capital is important to continue growing quickly, and Square needs to build additional services beyond the company’s point-of-sale system. Case in point, Square reportedly looked to hand off Caviar for around $100 million to a competitor like Uber or GrubHub, though it didn’t end up finding a buyer that would pay enough. Square is still looking for additional revenue streams, and it needs to do that if it’s going to prove to be a strong independent company and not just fill a slot for a larger financial organization. In the past year, Square is down around 15%. It has had a rocky path for the past twelve months, and while its last quarter showed some positive signs, it’s going to have to keep doing that to convince Wall Street to leave it — and potentially Dorsey — alone. With the upswing, Square once again pushed up its guidance for the fourth quarter and the full year. The company expects $438 million to $443 million in revenue for the fourth quarter, which fell around where Wall Street was expecting.